Here’s where I start to explore a broadened definition of “Sea” in Sea Life to include all things aquatic. Fresh and saltwater are one continuous body of H2O (water) molecules. However, tossing a bunch of salts in the mix makes for a major division between things that live on the salty side of the line and those that live on the fresh. 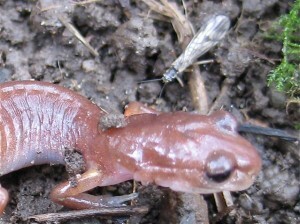 The community of visible critters in freshwater (streams, lakes, rivers, etc.) 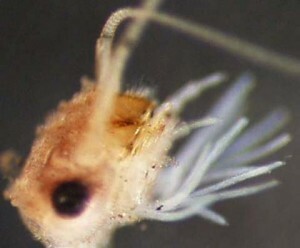 is dominated by aquatic insect larvae, but these juvenile insects are nearly absent in salty waters. There are some groups in which species have crossed over. Snails, clams, mussels, sand fleas, rolly pollies and crabs all have relative in fresh water. I’m sure I’ll touch on some of those over time, but first I wanted to get to the bug on the back of my neck. A couple weeks ago, I swatted at something that was sending shivers down my back as it crawled across my neck. When I drew my hand away, the small, dark insect had decided my hand was an equally suitable crawling space. It was small and delicate, with long thin wings that laid flat on its back. When I finally blew it off outside, this forestfly (or little brown stonefly, Nemouridae) fluttered clumsily away from the relative safety of my hand to the dangers of the air. 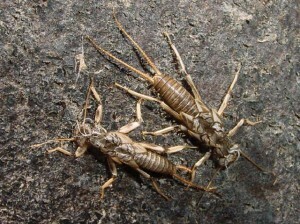 Forestflies are a family of stoneflies (Plecoptera = Greek for braided [plekein] wings [pteryx]) and very primitive insects. 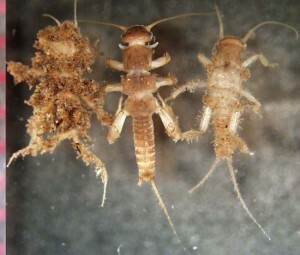 Like dragonflies and several other insect groups, the larvae (or nymphs) look similar to the adult insects. Instead of having the pupa stage that a caterpillar uses to change into a butterfly, these nymphs just shed their skin one last time, extend their wings and fly. Flying is clumsy business for a stonefly though. You’ll most often find them hanging out on vegetation, relatively close to water. As a group, they are particularly sensitive to human activities in the watershed and effective indicators of stream health. The forestflies and a few other small, vegetarian species of stonefly crawl from the water and sprout their wings in the winter or early spring. Forestflies are particularly big fans of small streams and and are often the last of the stoneflies to remain in streams that have been impacted by human activities. They aren’t predatory like some of their larger stonefly cousins, but serve an important role helping break down leaves and other plant matter. Something I find pretty cool about the forestflies is that several species have gills on their neck and head. These gills aren’t like those of fish. They look more like little soft fingers but provide that important function of helping them get extract dissolved oxygen from water. Hard to imagine those gills don’t get in the way though. Because their metamorphosis is so simple, you can often spot nubs of gills on the underside of the adult’s head as well, even though they’re no longer needed.